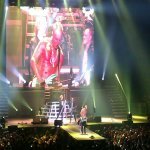 Def Leppard played a show at the Donosti Arena in San Sebastian, Spain last night and setlist details are available. There was no sign of "Ded Flatbird" but the band did play a 6 song opening set before all of the 'Hysteria' album was performed. 'Wasted' was the rare song kept in the set alongside more familiar "hits" like 'Let's Get Rocked' and 'Action'. The full 'Hysteria' album was played for the first time in Spain. A number of album tracks were also played for the first time in the country. The next show takes place tonight in Barcelona, Spain. Played for the first time in Spain since the 1983 Pyromania tour.